Our Disney vacation officially ended Friday morning at 4:30 when Jensen began a day filled with vomit. We suspect food poisoning, and we’ll just stick with that because anything contagious is simply out of the question. Because remember, the 3 weeks prior to our vacation were spent in seclusion with sick children. And frankly, I’m all done with that. I have 3 LARGE Hershey’s Milk Chocolate Bars burning a hole in my fridge. I bought 2 for the pending campfire smores, and my girlfriend Lisa and her family brought 2 more since they were joining us. None of the children wanted anything to do with marshmallows that had been set ablaze, so Lisa and I were pretty much the only folks in our party that ate the smores. And then I let Lisa talk me into keeping custody of the remainder of the chocolate bars, just in case there should occur a hormonal meltdown. While on vacation. And really, I hesitate to call that a vacation. Enjoyable as it was (save for the vomit), I’ve never been more exhausted. What am I going to do with these remaining 3 large bars of chocolate? I was hoping you all might have some wonderful ideas. And I also went online and found the following recipe, which I will be trying in the next week. Combine chocolate bar, butter and boiling water in medium mixing bowl; stir until chocolate is melted. Combine flour, brown sugar, baking soda and salt in large mixer bowl; gradually add chocolate mixture, beating until thoroughly blended. Blend in eggs, sour cream and vanilla; beat 1 minute on medium speed. Pour into greased and floured 13×9 inch pan. Bake at 350 degrees for 35 to 40 minutes or until cake tester comes out clean. Cool completely; frost as desired. 10 – 12 servings. What caught my attention about this recipe, was that it came from The Possum Kingdom Lake Cookbook. Possum Kingdom Lake is very close to where my mom grew up in Texas. And I have it on very good authority that she got into a great deal of trouble at Possum Kingdom Lake. 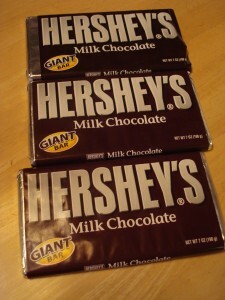 Anyhoo, if y’all have any other ideas for my Hershey’s Milk Chocolate bars, let me know. 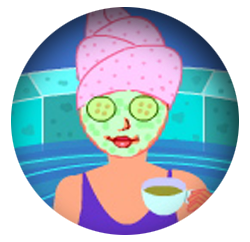 I’ll put up Mr. Linky if you have a recipe you’d like to share for Saturday Stirrings. Remember to link to your specific post, and then link up back here. Since next Friday is Christmas (oh dear Lord in heaven, I am so not ready), I’m going to take the whole weekend off, and Saturday Stirrings will resume after the first of the year. I may have a box of dark chocolate covered caramels with sea salt in a cupboard here. Don’t ask my how they got there…. Mix the cake mix, pudding, eggs, oil and milk together. Pour into three 9-inch cake pans that have been greased and floured. Bake at 350 degrees for 25 minutes. For the icing, mix cream cheese and granulated sugar until smooth. Blend in powdered sugar. Add Cool Whip, pecans and Hershey bars. Mix this in a mixer. Refrigerate cake after icing. I think you should send them to me. I could eat them for you. I mean I’d consider it a sacrifice, yes a sacrifice I’d be willing to make for you and your buns. I’m only thinking of you, you know. I mean if you ate them or made anything with them, you’d have to add a gazillion hours to the ellipitical and I’d hate for that to happen. You could also make your normal pancake recipe, grind the chocolate and coffee beans very fine. Add to pancake batter and voila! You have Mocha pancakes. Crush the cookies. Soften the cream cheese and mix with cookies. scoop out small balls. Place on foil/wax paper covered cookie sheet and freeze until hard. Melt the chocolate and dip the balls in. Let harden. Try not to eat them all. If you are feeling creative take a bit of white chocolate (or nuts, or coconut, or sprinkles) and drizzle on before milk chocolate hardens. The first thing I thought of was to break off a piece, roll it up in crescent roll dough and bake it. I make them with chocolate chips and I’m sure the hershey bar would work as well. They are amazingly good and so easy. You can also use any mini,” fun-size” candy bar. I saw that someone had recommended oreo truffles and those are great as well. I would recommend using a food processor (or vitamix!) to crush the oreos. I’ve tried doing it by hand and they mix with the cream cheese and look so much better when I use the food processor. Interesting…from reading your past several posts it seems that our menstrual cycles are in sync and also our kids being sick syncs fairly closely. Does that MEAN anything?!? Because it would be nice to find meaning in some of this craziness (: Sorry, no chocolate recipes. I hope to start baking when the household is healthy!